138 PA candidates passed all 8 written papers. 6 Non-Local Architectural Professionals (NLAP) applicants passed Papers 1 and 2. 138 PA candidates will be invited to take the Professional Interview scheduled for 28 March 2019 while 6 NLAP applicants will be invited to the Professional Interview scheduled for September 2019. Architects Registration Board, HKSAR, thanks you for your support and wishes you a Happy Chinese New Year. 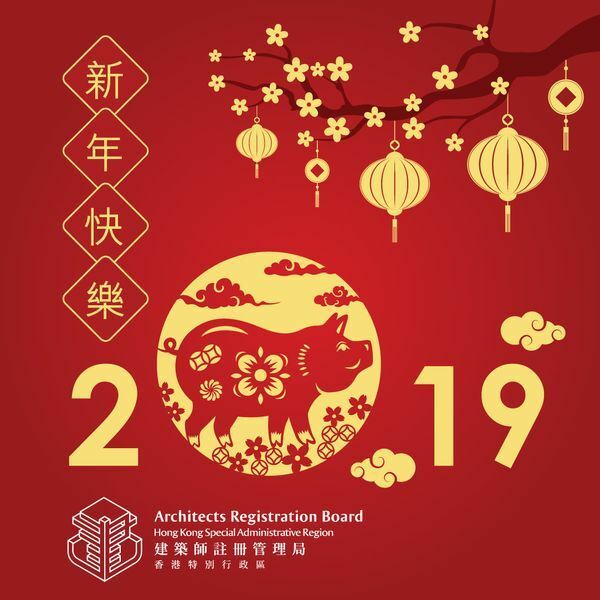 Please be informed that your registration with the Architects Registration Board, HKSAR ("the Board"), will expire on 1 April 2019. To renew your registration for a further period of 12 months, please complete and return the enclosed Application Form for Renewal of Registration on/before 3 March 2019. You are kindly reminded that it is your responsibility to notify the Board of any change in the details and particulars in your original application form as required under Section 12(3) of the Architects Registration Ordinance ("ARO"). The fee for renewal is HK$1,300 - per year. Please return to the ARB Secretariat (address shown at the bottom of this letter) the completed form together with a crossed cheque payable to the "Architects Registration Board" on or before 3 March 2019. 4-31 March 2019 A fee for extension of time for renewal after the deadline for $530- shall apply to all applications post-dated 4–31 Mar 2019 until the removal of the name from the Architects Register. 1 April 2019 Expiry of registration. The defaulters will be issued a 28-day notice on the termination of the registration. You will be issued a Certificate of Renewal of Registration upon the acceptance of your renewal of registration. If you have further queries, please contact Ms Mable Hung at 2805 7297. 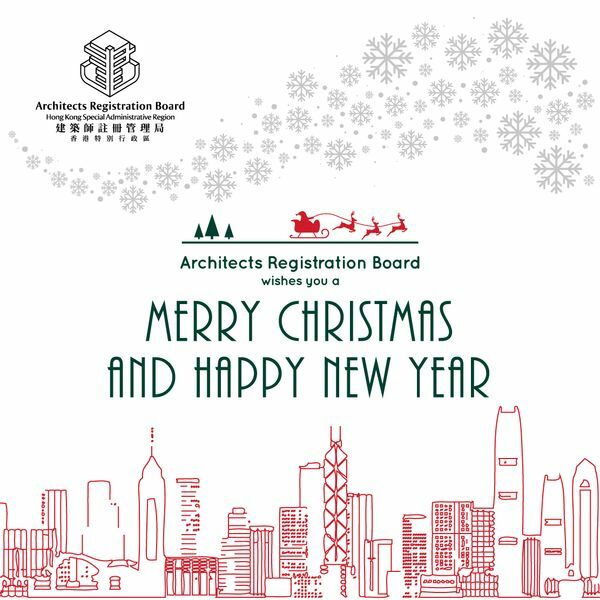 Architects Registration Board, HKSAR, thanks you for your support and wishes you a Merry Christmas and Happy New Year. We are pleased to inform you that registration for PA 2019 - Papers 3, 4 and 5 (July) is now open until 5:30pm on 31 December 2018 (Monday). As only 200 quotas will be allowed for the coming assessment, the registration will be on a first-come-first-served basis. Please register early to reserve your seat. Please click here for details of registration. Starting from PA 2018, hard copy of application form is NOT accepted. Candidates who wish to take PA 2019 - Papers 3, 4 and 5 (March) should register at www.joinhkia.net. Should you have any question, please contact the Joint HKIA-ARB Secretariat Staff at 2511 6323. Non-Local Architectural Professional (NLAP), after going through an assessment jointly held by the Hong Kong Institute of Architects (HKIA) and the Architects Registration Board HKSAR (ARB), may become a member of HKIA and as a registered architect under Architects Registration Ordinance. HKIA and ARB are now inviting eligible NLAP to apply for admission via the Non-Local Architectural Professionals Admission 2019. For the eligibility and application details, please click here. 2 candidates passing Non-Local Architectural Professionals 2017. Please click here for their names. ARB is invited by the Buildings Department to make 4 nominations to the Minor Works Contractors Registration Committee ("MWCRC") Panel for a term of 2 years commencing 2 January 2019. ARB is invited by the Buildings Department to make 11 nominations to the Contractors Registration Committee ("CRC") Panel for a term of 2 years commencing 2 January 2019. ARB is invited by the Buildings Department to make 8 nominations to the Registered Inspectors' Disciplinary Board Panel for a term of 3 years commencing 2018/2019. In accordance with sections 4(1) and 4(3) of Architects Registration Ordinance ("ARO"), Laws of Hong Kong, the Council of HKIA at its meeting on 21 April 2018 appointed the following 10 HKIA members (in alphabetical order) for 2 years. Together with the Sr. LEUNG Lap-ki, member appointed by the Chief Executive under section 4(2) of ARO, the ARB 2018-2020 would take office on 17 May 2018. * The AP workshops are over-subscribed. No further registration will be accepted. Limited seats available. Enrolment is on a first-come-first-served basis. For details, please click here for details. For details, please click here to download the reply form or here for online registration. 4 candidates passed all written papers of Papers 3,4 and 5 (March) and are eligible for Professional Interview. * The second workshop will be organized in coming weeks to accommodate HKIA Members whose enrollments are not successful for the first Workshop to be on 17 April 2018. Please stay tuned with ARB website. Reference is made to the Guidelines on Qualifications for Renewal of Registration of Registered Architects with regard to Different Categories of Qualifications (thereafter the "Guidelines") under the Architects Registration Ordinance, which have been issued by the Architects Registration Board, HKSAR, (the “Board”) to all Registered Architects in September 2017. Effective from 1 October 2018, Registered Architects under Categories 1A, 2A, 3A, 1B, 2B and 3B as classified under the Guidelines are required to submit documentary evidence, supporting documents and the prescribed fee for ascertaining these documents as stipulated in Appendix 3 of the Guidelines, in addition to the completed prescribed form and the prescribed fee for application for renewal of registration. The prescribed fee for ascertaining the documentary evidence and supporting documents as stated in Appendix 3 shall be HK$5,400.00. Should you have any question, please contact the undersigned or Ms. Alison Ng at 2511 6323. 74 out of 102 candidates (72.55%) passed the Professional Interview held on 22 March 2018. Please click here for the result. • Please click here for the name of candidates who have PASSED ALL WRITTEN PAPERS of the HKIA/ARB PA2017 - 4th Quarter. They are eligible for Paper 9 Professional Interview in September 2018. • Please click here for the name of candidates who have PASSED Paper 1 and 2 of the HKIA/ARB NLAP2017. They are eligible for Paper 9 Professional Interview in September 2018. Mrs. Rita Cheung, Registrar of the Architects Registration Board since its establishment in 1990, has retired on 31 December 2017. The Board is grateful for her staunch support and dedication in the keeping of professionalism at the forefront of the building industry in the past decades. We wish her a happy retirement. The ARB is also pleased to announce that Ms. Vivian Sie, shall act in the capacity of the Registrar under Section 11 of the Architects Registration Ordinance (Cap. 408), until further notice. Please see the enclosed announcement. On behalf of Architects Registration Board, HKSAR (“ARB”), I am writing to inform you that the enclosed Guidelines on Qualifications for Renewal of Registration of Registered Architects with regard to Different Categories of Qualifications under the Architects Registration Ordinance (Cap 408) – Edition 01: Sept 2017 have been recently endorsed by ARB. ARB, as a statutory body incepted since 1991, is empowered to process applications for renewal of registration for Registered Architects (RAs) in accordance with the Architects Registration Ordinance (Cap. 408), Laws of Hong Kong. To this end, the enclosed Guidelines are prepared to facilitate RAs to apply for renewal of registration, with reference to different Categories of Qualifications. ARB will update this Guidelines from time to time, if needed. The Guidelines have also been uploaded onto HERE for public information. Should you have any question, please send email to the ARB Secretariat arbsec@arb.org.hk. The Architects Registration Board (“ARB”) is invited by the Buildings Department (BD) to make 6 nominations of registered architects (“RAs”) that ARB considers suitable to Chief Executive (“CE”) for consideration of appointment to the Private Columbaria Board & Private Columbaria Appeal Board (“PCB & PCAB”) for a term of six years commencing on 1 October 2017 tentatively. The CE shall appoint 3 RAs for Board and 3 RAs for Appeal Board. The BD reserves the rights of examining the suitability of the nominees in order to adhere to the provision of the Buildings Ordinance. The BD requires that the nominees are preferably at the age below 62 and should possess the necessary expertise and are conversant with building safety, fire safety and structural safety aspects. Besides, the nominees for the Appeal Board are preferably having previous experience of serving on appeal boards or tribunals, but should not be a member of the Board according to clauses 81(2) of the Bill (http://www.fehd.gov.hk/rpc/tc_chi/ordinance_draft.html. To ensure a well-balanced representation, ARB would take into account gender balance and all age groups in participation in such advisory and statutory bodies, where appropriate. Should you be interested in being nominated to PCB & PCAB, please submit to me by fax (no. 2519 6011) or by email (arbsec@arb.org.hk) with the following documents on or before 2 March 2017. Should you have any question, please contact Ms. Alison Ng (Tel: 2511 6323) of ARB Secretariat. Please be reminded that the 2016 Election Committee Subsector Elections will be held on 11 December 2016 from 7:30am-10:30pm. Should your name appears on Architects Register, please cast your vote on 11 December 2016. ARB is invited by the Buildings Department to make 10 nominations to the Minor Works Contractors Registration Committee (“MWCRC”) Panel for a term of 2 years commencing 2 January 2017. ARB is invited by the Buildings Department to make 11 nominations to the Contractors Registration Committee (“CRC”) Panel for a term of 2 years commencing 2 January 2017. On behalf of ARB, I write to invite your indication of interest to participate in our two Committees (LAC and RC) for term starting 1 September 2016 – 31 August 2017. Attached please find the list of ARB Committees and the relevant term of reference for your information. By serving on the Committees, you will be able to gain experience in ARB’s operation and contribute to the advancement of its works and services. 2. Commitment to share the workload of the Committees. Frequency of the Committee meetings will be determined by respective Committee Chairpersons. If you are interested, please complete the attached reply slip stating your preferences and return to the Secretariat by 18 July 2016. The selection and appointment of members to Committees will be at the discretion of the ARB. Notification of appointment for 2016-2018 will be made in late August 2016. Should you have any questions, please contact the Secretariat, Ms. Mable HUNG or Ms. Alison NG, at 2805 7297 or 2805 7093 respectively. For the full list of ARB membership and its Committees 2016-2018, please click http://www.arb.org.hk/AboutUS.html. Thank you for your interest in participation and we look forward to working with you. With the objective of upholding the professional standard, the Institute has reviewed the existing PA Handbook and the amended PA Handbook will be effective from PA 2017 except amendment 4 which has been effective from PA2016. In accordance with sections 4(1) and 4(3) of Architects Registration Ordinance, Laws of Hong Kong, the Council of HKIA at its meeting on 30 April 2016 appointed the following 10 HKIA members (in alphabetical order) for 2 years. Together with the Sr. LEUNG Lap-ki, member appointed by the Chief Executive under Section 4(2) of ARO, the ARB 2016-2018 would take office on 17 May 2016. Voters should provide true and accurate registration particulars, and report any changes in registration particulars to the Registration and Electoral Office. For details, please click: here. Flyer can be downloaded at here. for a term of 3 years commencing 1 June 2016. In order to ensure effective communication with a single contact point, please note that all correspondence to the Architects Registration Board, HKSAR ("ARB") shall be sent directly to the ARB premises located at 19/F, One Hysan Avenue, Causeway Bay, Hong Kong. The use of P.O. Box 20334 by the ARB at Hennessy Road Post Office had been terminated since July 2015. Please be reminded that with immediate effect, misdirection to the said P.O. Box would not be accepted by ARB as a valid reason for belated application for registration and renewal. A person whose name does not appear on the register shall not be entitled to describe himself as “architect” or “registered architects” or to use the initials “R.A.” after his name. i.e. a person is not entitled to use the title of “architect” if his name is not on the Architects Register kept by ARB. **Please browse the Register from HERE. 2) How to qualify for registration as an Architect? To become an “architect” or “registered architect”, a person MUST fulfil section 13 of ARO. Otherwise, the ARB shall refuse his application. Full text of ARO can be downloaded from HERE. With regard to the person named as an “architect” on the media coverage dated 5 October 2015, his name was not on the Register and he cannot be described as an “Architect”. I am writing to update you on the recent decision of the Architects Registration Board, HKSAR ("ARB") regarding the publication of ARB disciplinary order for registered architects (“RAs”). 2. in case such appeal against the disciplinary order has been made, for 6 months only after the appeal is finally determined. The said measure will take effect starting from 1 October 2015. Kindly note that the ARB is committed to continuously enhance its statutory duties under ARO for the registration of RAs and the disciplinary functions for compliance, which is of great importance to our profession. I am writing to inform you that the deadline of the nominations has been extended to 3 October 2014. - 5 vacancies of MWCRC. 2) Amongst 1), total number of projects that you involved in Registered Contractors’ Contract Administration / Minor Works Administration. The functions, composition, criteria as well as the nomination form of the CRC and MWCRC for your easy reference. Remarks: Those who have put forward their nominations during the first call for nomination need not re-send. Deadline for nomination is extended to 11 April 2014 (Friday),12noon. Upon fulfilling the qualifications for registration as per Section 13 of the Architects Registration Ordinance (ARO), “The Registrar may, on payment by a registered architect to the Board of a fee, issue to the registered architect a certificate of registration or a certificate of renewal of registration in the form specified by the Board” in accordance with Section 18 of ARO. a) Only ONE original hardcopy of CoRoR shall be issued to the qualified RA upon renewal of registration. b) Until the next renewal of registration, NO replacement copy of the original CoRoR will be issued in the interim. A surcharge of HK$300 would be required for every CERTIFIED TRUE COPY of CoRoR. d) The existing practice of the issuance of replacement copy of the original CoR at a surcharge of HK$ 300 shall remain unchanged. (ii) Advisory Committee for the Fire Safety (Buildings) Ordinance and Fire Safety (Commercial Premises) Ordinance for a term of 3 years commencing 1 June 2013.